Open a new image 800 x 800 or one you prefer, resize paper 1 to 23%, paste, apply your mask, delete, merge group, adjust your mask to fit your tag later. Resize element 25 to 23%, duplicate, being on the bottom frame, free rotate to the left at 10 degrees, move to the left a little bit, then erase the parts showing below the top frame, being on the top frame, merge down. expand by 5, resize paper 2 to 23%, paste, invert, delete, select none. Paste your tube on the paper layer, resize to 75%, duplicate, move above the frame, erase the parts covering the frame, candles and ornaments. Apply the Xero filter-Porcelain on both tubes, then Clarity. Duplicate the frame, mirror and take your free hand tool and draw around the outer greenery and the two ornaments, copy paste as a new layer, then delete the rest of that frame. This will take a little patience, you might try erasing the parts you don't want to keep. Resize element 22 to 15%, place at the upper left, duplicate, mirror, flip, adjust. Resize element 6 to 15%, paste at the upper left, just above the mask layer, duplicate, mirror, duplicate, flip, duplicate, mirror, duplicate again if needed and adjust, then merge these layers together and apply the Xero filter-Porcelain. Resize element 15 to 15%, place on the left below the candles, sharpen once, duplicate, resize to 65%, paste on the right just below the greenery. Resize element 7 to 10%, paste on the candle at the bottom. On element 16, take your free hand tool, draw around the rope hanger and delete, then resize to 10%, paste on the upper left part of the frame, duplicate, move over and down on the right. 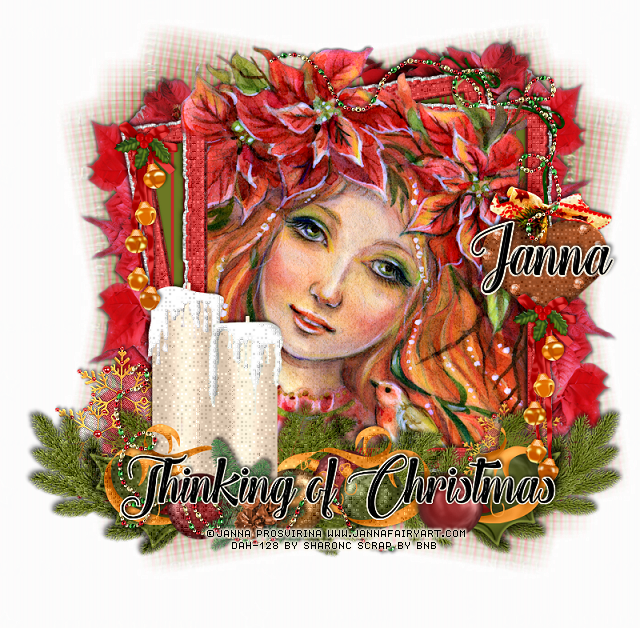 Add any wordart if you like, I wrote out Thinking of Christmas, then applied a glass bevel, using EyeCandy 4000, then selected the wordart, float, defloat, expand by 2, new layer fill with a color of choice, select none and move below the wordart.